This is by far the longest I have been away from Scottish winter and despite there being very good conditions back home we are equally having great conditions here. Yes, we have had Category 5 (very high) twice this season and the 'worst' conditions (in regards to avalanches) since 1991, and we have had fluctuating temperatures but there have still been countless days where we have had great snow and ice. This season is (hopefully) the last winter season before I become a full IFMGA Mountain Guide. So the aim is to observe as many guides as possible as well as build a great deal of experience and knowledge before I am let loose on my own. So I have spent some brilliant days, skiing, ice climbing, observing guides and getting to know new areas. Bring on a good season. Here I'm abseiling into the top of the ENSA. We thought we would try a day of snowboarding. It has been 6 years since I last snowboarded, still great fun. Some great ice in Cogne. This was our 2nd trip to the Valley in Italy. Jack, Fat boy and I shared Rachel Kerr for the afternoon for some ski instruction to brush up our technique. A well worth afternoon. A great day on the Vallee Blanche. We did two laps today with a good team of guides and friends. A great way of absorbing their knowledge and having a great laugh. So, a great start to the season, Im looking forward to the next part. I have just returned from an avalanche course ran by the legend Alain Duclos. 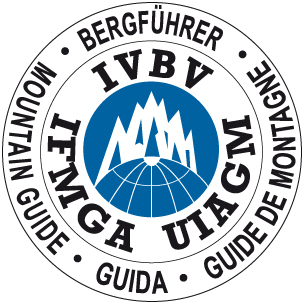 This week, I will be on a course run by the BMG on 'Off-piste guiding' so looking forward to learning all about it. Over the last 11 seasons of winter climbing I realise that it is far more enjoyable after a good trip sport climbing or even rock climbing to round off the summer season. As I spend most of the season trad climbing, I find it quite enjoyable to go sport climbing, fall off lots of routes and hopefully get up something harder than previous years (it happened this year!). Lou and I blasted off for a wee while to soak up the sun then hide in the shade when it was too hot. We decided early on to go for 2 days on and one day off giving us time to try hard and time to relax and enjoy the islands we were visiting. Im sure most of you will recognise where we were climbing, if not, i'll give you a clue. Somewhere in Europe and it wasnt the UK. So I'll not bore you with lots of words but here are some pictures. Lou's first go...scariest part of the trip for me! She bossed it! 1st crag, first day, a 40m route and we then had to deal with a head injury from a fallen climbing. Glad I did my first aid a week ago!